I was summoned for jury duty for the state of Pennsylvania and couldn't wait. Obviously, part of the excitement was hoping I got chosen to be a juror. The other part was a day of potential people watching and some quiet time to read a book...heck, this is a day off work people! For those of you who don't know, when I was in college I interned at a local news station, our CBS affiliate network. My favorite days on the job were court days. I enjoyed the interrogation, the story, the trial. While it's not glamorous or pleasant in some cases, it's definitely interesting. The first part of my story and experience is sort of a brain dump and notes from my phone while waiting in a large room with hundreds of other people. I had to report for my jury summons to the courthouse by 8:30 am. I HATE being late and am usually early. The one thing I didn't think of when not being on my normal work- daycare drop-off routine was traffic. I parked my car in the nearby garage at 8:27 am and literally ran the few blocks and up the steps of the courthouse. Of course, there's security to go through, coats to take off, cell phones to lock up...what a procedure. I get checked in and make myself comfortable with my book and notice at 9:40 am, the first time I check my phone that people are STILL checking in. At 9:43 the older gentleman seated to my left asks if there's going to be coffee and donuts provided. I think he's half serious. A little bit later, a guy with St. Patrick's day beads, a Grateful Dead tee and shorts walks in. I'm certain he was wearing the same thing for the holiday the day prior. Also, it's currently 38 degrees in Erie, Pa.
A group of 3 ladies seated around the only table in the room are holding up their canes and comparing size, color and texture. Interesting. It only takes 2 hours before I hear the first comment about the government. A few moments later, one of the Jury Coordinators comes in the room and plays a video about Jury Duty. I see 2 people sleeping during the video. At 10:40 an employee comes to tell us she has mints if anyone needs them. I laugh to myself while wishing she had said bacon instead. The lady calling out names once the selection process finally begins pronounces my name correctly, good stuff. I do notice she needs helpers though...with 200 people in the room, distributing papers and collecting other papers she has a lot going on. The same lady has said about 6 times that you need to yell HERE loudly when she says your name so she can make her way to your direction and distribute the papers, yet people are raising their hands or doing nothing at all. We were taken in to the courtroom and the next part of my story began for the process of what I call "weeding jurors out". Both attorneys (or in my case-one attorney, the defendant chose to represent themself) look through the paperwork we filled out and call you up to ask further questions if needed. For instance, if you're traveling that week, think that you will have bias regarding the case and other things. I was not called up, and due to having a blood relative who was a State Trooper I was kind of surprised. Handfuls of people began to leave the room as they were dismissed by the Judge and Jury Coordinator and my chances at having a shot to be a juror were increasing by the second. They asked the 12 people currently seated in the juror's box to go stand on the other side of the room and if your name was called, please report in order and seat yourself in the box. "Emelia Lawrence, Juror #8" was said and I happily stood up and walked to my seat. I DID IT- I MADE THE TEAM! In all seriousness, I really wanted to do this. I'm a huge fan of thrillers, Law & Order SVU, and investigations...I blame it on my Dad. But I always have been and this was something that was on my unofficial list of things to do in life. The Judge read over some rules, how the case may play out, that it was an armed robbery case and dismissed us for lunch- FINALLY at 1:30 pm. I walk over to a nearby deli for a sandwich and when I'm paying, tell the employee that I'm going to grab a pop from the cooler also. A man standing by the cooler asks where I'm from since I'm calling it a pop. Long story short, he's also a juror on the same case, a retired Pennsylvania State Trooper and knows my Dad. We exchange stories, end up eating lunch together and find out that we share lots more common interests, career paths, etc...This probably would have not happened unless I was on jury duty...thank you, again. Our group promptly returns from lunch and we realize that court time and real-life time moves much differently. We aren't told many details by the Judge's staff- seems like this is a norm, and it's understandable but frustrating at times. It's a lot of sitting and waiting, lining up, sitting back down, waiting, being warm, then freezing, being out of touch with what time it is unless you wear a watch (as the only clock in the courtroom is very high above our heads in the juror's box). We get started on the case, hearing more information from the Judge, and opening statements from the defendant and District Attorney. I'm not going to share all details of the case, but it was for armed robbery. I was mind-blown with the lack of evidence and reasonable doubt in this case and the lack of credibility of certain members. Again, without going in to great detail in this case, the defendant was being charged with 5 counts and accused of robbing 2 members with a gun in their vehicle. This person supposedly stole a cell phone and large amount of cash from them. The defendant was never found with a gun, a cell phone, and only 1/3 of the money they were accused of stealing a few hours later. The case continued for 2 days and as closing statements were finished I started to worry that we may be in deliberations for quite a bit because it could take time to all come to the same verdict. Once we deliberated in to the juror's quarters our cell phones were taken from us again and all belongings were locked up. We couldn't leave the room until a verdict of 12-0 was reached. Our 2 alternate jurors were sent away and told they may be called if needed. The Judge's staff brought us lunch, and we weren't allowed to talk about the case during that time. If we had any questions we were to write them down and submit them to the staff who then takes them to the Judge. This was something I wasn't aware of, we also were not presented with the few pieces of evidence that were submitted (some police reports and a list of the belongings taken from the defendant at time of arrest), but could ask to see them. I was appointed the foreperson of the jury and had to sign and date all official papers and take down our verdict for each count the defendant was charged with. Once we finished lunch and were permitted to begin official deliberations we decided to take a preliminary type of vote to see where everyone stood on each count. I was quite surprised when we all said not-guilty for every single one. We talked about the lack of evidence, the sketchy timeline, the stories that kept changing by the one victim and other points and many other points to be sure we all had a chance to speak on the matters at hand. It was civil, respectful and we talked about all the points of a verdict and law that the Judge had discussed with us. Being a juror was an interesting, exciting and honorable experience. I'm so glad I had the opportunity to do this at least once in my lifetime and while I understand the process of being summoned for duty isn't thrilling, it is our civic duty. I feel privileged to live in a country where we can exercise these rights. We were thanked many times by the defendant, Judge and his staff for our patience and time and that was much appreciated that they realized this wasn't an easy time or a vacation from work. I wouldn't mind having the opportunity to serve on a jury again in the future. I think having the right attitude and viewing jury duty as an opportunity helps. I learned so much and have a greater respect for all involved in the court system. 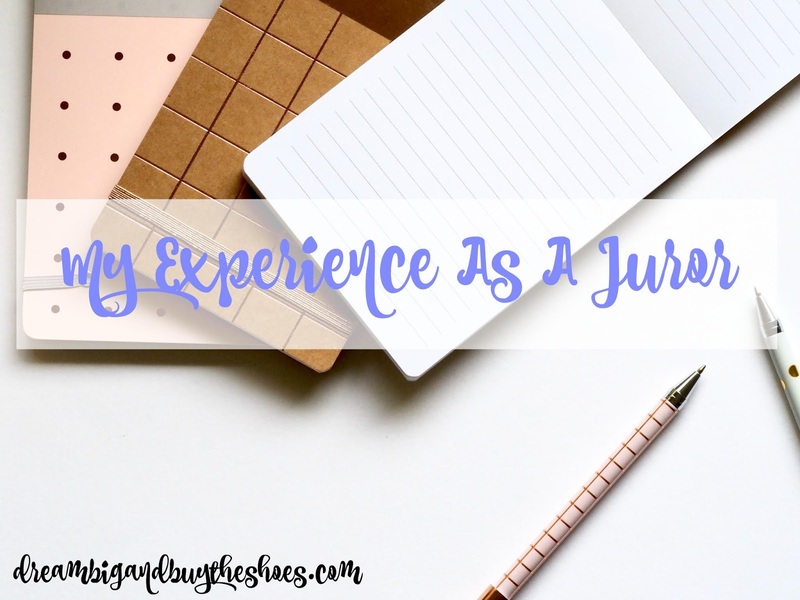 Have you ever served on a jury?